Sweden is the largest of the Scandinavian Nations, situated in northern Europe, wedged between Norway to the west and Finland to the east. A geographically longitudinal country, Sweden’s landscape is beautiful and diverse in equal measure. The sparsely populated north is an area of untamed, Arctic wilderness comprising lush forests, over ninety thousand lakes, winding rivers and massive mountains, offering fantastic winter sport environments. Unsurprisingly, a love for the great outdoors is a common theme in Sweden, with popular local pastimes including mushroom foraging, berry picking, hiking, camping and fishing. Standing proudly in the central region, the capital, Stockholm, is one of the nation’s best attractions, known for its fragmented appearance of seemingly endless waterways and islands, connected by fifty seven bridges. It also hosts an array of fine museums, an inventive cuisine and a superb selection of shops. The old town, named Gamla Stan, is a fine showpiece of Swedish history, with majestic palaces and fairy-tale, cobblestone streets hidden just a stone’s throw away from the ultra-modern city centre. 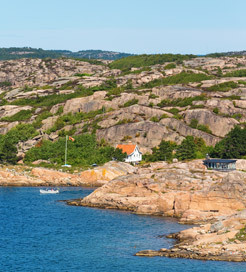 The southern Swedish tip encompasses ten provinces, including the much-visited and UNESCO World Heritage Site-lauded islands of Oland and Gotland. Gothenburg, on the southwest coast, is an important seaport, boasting a picturesque waterfront and neoclassical structures alongside trendy cafes, bars and restaurants. Malmo is a useful gateway to the Danish capital of Copenhagen, thanks to the Oresund Bridge, while the city itself has an extensive network of cycle routes. With some of the highest standards of living in modern Europe, owed to its extensive welfare benefits and skilled labour force, Swedish history has played a vital role in shaping what we see today. A military power during the seventeenth century, and once roamed by the fearsome Vikings, Sweden has not participated in any conflicts over the last two hundred years. However, evidence of its more warlike past can be spotted throughout the country; you’re likely to discover fascinating rune stones, eerie burial mounds and enormous, medieval walls along most scenic walks. Ferry travel is widespread in Scandinavia and northern Europe, with Sweden conveniently located for numerous, relatively short sailings from many different countries. There are also plenty of domestic routes from the Swedish islands, but the majority of ferries arrive from international destinations including Germany, the Baltic Nations, Russia and Scandinavia, all operated by a wealth of excellent ferry companies. For more information, please visit our Ferries from Aland to Sweden page. For more information, please visit our Ferries from Denmark to Sweden page. For more information, please visit our Ferries from Poland to Sweden page. For more information, please visit our Ferries from Finland to Sweden page. For more information, please visit our Ferries from Germany to Sweden page. For more information, please visit our Ferries from Lithuania to Sweden page. For more information, please visit our Ferries from Estonia to Sweden page. For more information, please visit our Ferries from Latvia to Sweden page. For more information, please visit our Ferries from Norway to Sweden page. For more information, please visit our Ferries from Russia to Sweden page. For more information, please visit our Ferries from Gotland to Sweden page.